To understand what the Teredo Tunneling is, you first need to know what an IPv4 and IPv6 is. IPv4 is an IP Protocol which assigns our computers with a unique address which is our identity to communicate with the world over the internet. Most of us, are on the IPv4 technology and so is the rest of the world. However, due to all the IPv4 available addresses being occupied the Internet is running out of IPv4 addresses as more and more of us have started using internet and networks heavily which is the main reason we now have the IPv6 (Internet Protocol Version 6) which brings in an uncountable number of addresses, that is 2 to the power of 128 – 2^128 (340,282,366,920,938,000,000,000,000,000,000,000,000) never-ending. Now that you know about the shortage of IPv4 addresses – it’ll be easier to understand what the Teredo Tunneling is. IPv4 is still being heavily used, to put it in it’s simplest terms, I’d say that previously every one knew one language, but now there are two so the person (system) speaking in an IPv4 language will be understood by the same but not by those speaking in the IPv6 language, hence making networks talk to each other will not be possible and internet is all about networks connected and talking to each other – therefore, we need an interpreter to translate IPv4 to IPv6 and vice-versa and this is what the Teredo Tunneling is, it is an interpreter to process the v6/v4 language. Download and run Reimage Plus to scan and repair corrupt/missing files from here, if files are found to be corrupt and missing repair them and then see if the Teredo Tunnel Adapter is restored, if not follow the steps below. In this section, I’ll show you how to install the Teredo Tunneling Adapter on Windows 7 – the driver is built into Windows 7. 1. 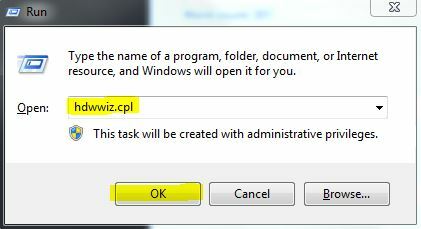 To install it, go to device manager OR Hold the Windows Key and Press R. In the run dialog that opens, type hdwwiz.cpl and Click OK.
4. Click Next and Next again and Next again (it will not find anything, so do not worry). You will then be taken to Common Hardware types, select. 5. Scroll down and select Network Adapters then Click Next. You will now be taken to the Add Hardware dialog. 6. Now from the Manufacturer tab select Microsoft than from the Network Adapter tab select Microsoft Teredo Tunneling Adapter and Click Next. 7. After you click Next, Click Next again then Click Finish. Press Windows key + R to open up a Run command. 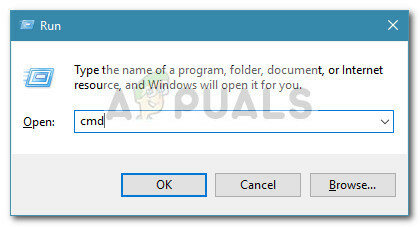 Next, type “cmd“, press Ctrl + Shift + Enter and choose Yes at the UAC (User Account Control) prompt to open up an Elevated Command Prompt. Once the interface has been disabled, close the elevated Command Prompt and reboot your computer. Return to Device Manager and see if the Teredo Adapter is now enabled. Close the Elevated Command Prompt and restart your computer. 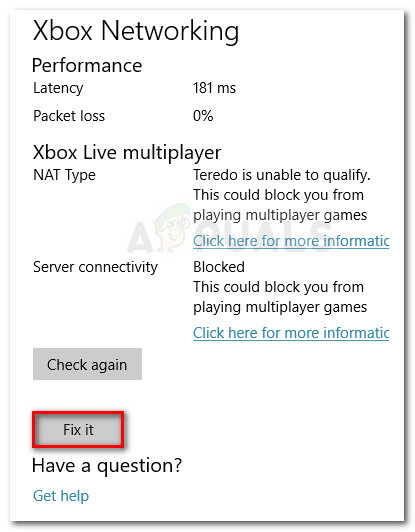 See if the issue has been resolved and you are able to see the Teredo adapter in Device Manager at the next startup. 3. In the right pane, right-click Disabled Components and select Edit. Set the DWord value to 0. 4. Restart your computer and the Teredo tunneling adapter will now start. Since the Teredo Adapter is quite a legacy component by now, Microsoft Decided to remove it starting with Windows 10 build 1803. Press Windows key + R to open up a Run box. 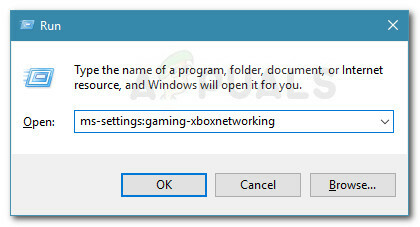 Then, type “ms-settings:gaming-xboxnetworking” and hit Enter to open the Xbox Networking tab of the Settings App. Once you access, let the software complete the checks and press the Check again button if the scan doesn’t start automatically. If the Server connectivity is Blocked, scroll down below and click on the Fix it button. Reboot your computer and see if the issue has been resolved. Make sure Windows Firewall is up and running. Otherwise, Windows will block the server connection by default. Press Windows key + R to open up a Run box. Next, type “powershell“, press Ctrl + Shift + Enter and click on Yes at the next UAC (User Account Control) prompt to open an elevated Powershell window. Restart your computer and see if the issue has been resolved. Press Windows key + R to open up a Run box. 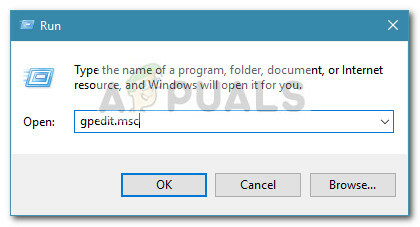 Then, type “gpedit.msc” and hit Enter to open the Local Group Policy Editor. Note: Keep in mind that the Local Group Policy Editor is only available on several Windows 10 versions. Inside the Local Group Policy Editor, use the left pane to navigate to Computer Configuration > Administrative Templates > Network > TCPIP Settings > IPv6 Transition Technologies. Move over to the right-side and double-click on Set Teredo Client Port to edit this policy. Set the policy to Enabled and set the 3544 port. Keep in mind that in order for this to work, the port needs to be open and forwarded through your router. If you don’t know how to do this, look for specific instructions related to your router manufacturer.